The Prairies and Lakes region is a transitional area for many plants and animals, whose ranges extend northward into the Great Plains or eastward into the forests. 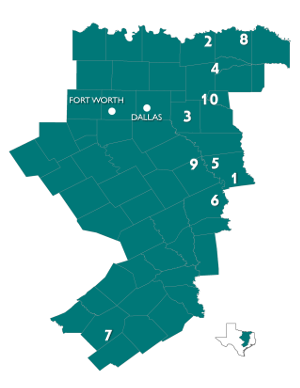 This region, sometimes called the Cross-Timbers, was named by early settlers, who found belts of oak forest crossing strips of prairie grassland. Average annual rainfall averages 28-40 inches per year. May or June usually brings a peak in monthly rainfall. Upland soils are light colored, acidic sandy loam or sands. Bottomland soils may be light brown to dark gray and acidic with textures ranging from sandy loams to clays. The landscape of the region is gently rolling to hilly and elevations range from 300 to 800 feet above sea level.